The Majestic was Indiana’s first entirely steel framed skyscraper building. Rising to ten stories high, the building has brick walls and Indiana limestone veneer. The Indiana Gas Company constructed the building in 1895–96 to serve as a new business headquarters. Oscar Bohlen of D.A. Bohlen & Son was the architect. Though it was intended as the main office of the gas company, other businesses located here too. The New York Central and Big Four Railroads maintained Indianapolis offices in the Majestic at various times in the early 20th century, for example. Bohlen’s exterior design for the Majestic uses the strength of the Romanesque Revival style. The large entrance arches are intricately decorated with foliate and acanthus carvings. The center grouping of three massive arches in the center of the upper stories, flanked by bookends of triple windows, gives the building its monumental character. 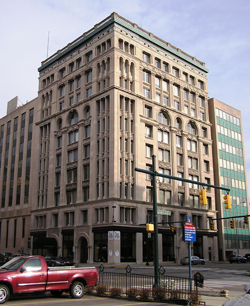 Majestic Building is located at 47 S. Pennsylvania Street. The building houses several businesses that are open various hours.